He wailed. He moaned. He cried. He was nine. What could I say? I could see so many options. He needed to think bigger, longer term. He was so much closer than he realized. Mowing lawns is not the only way to earn money. I swallowed the perfect lecture bubbling up in my throat. From a hilltop, a man looked out across the valley. Panting, his heart rejoiced. In the distance he could see his goal. At last! It was in reach. He gazed at the path. He gasped. So close and now, failure. For a while, he thought, he planned, he wondered, he despaired. There was no way to cross, no bridge in sight. He cried. He stormed. He raged. He blamed. 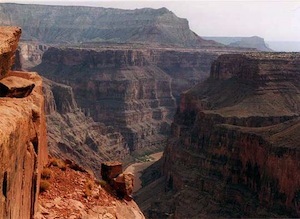 He looked longingly at his goal and angrily at the canyon barring his path. A seesaw of emotions tormented him, rocking between anger and depression with nauseating speed. This is how it always is for me. Things never work out. What was I thinking going on this journey in the first place? Who do I think I am? Why should I try? I knew I’d never make it. He slumped into the shade of a nearby tree. I’ll go somewhere else tomorrow. There must be a better place to go anyway. He drifted off into a restless sleep. Sweating and exhausted another man came up the hillside. He caught site of the goal. He rejoiced. Momentarily, concern washed over him when he saw the canyon. He laughed, knowing there was no bridge to cross. But he journeyed on. Down he marched into the valley. Onward through marsh and mud. Snakes hissed, scorpions scuttled across his path. He reached the cliff’s edge weary from the day’s labors. He looked across the terrible gap. Then he looked down. Unseen from the hilltop, or even a few feet from the cliff’s edge was a narrow path. And just above the roaring river, deep in the canyon, a bridge! Who would have guessed there would be a bridge down there? I’m sure glad I kept walking. With a spring in his step, down the path he went, across the bridge, up the other side. The sun was setting when the first man woke. He stretched and took one last look at the goal he was giving up. Shocked he saw a man on the other side of the canyon, walking resolutely up to the city gates. How? How did he get there? He must have come from another direction. There is no earthly way to cross that canyon. Ah, some people have all the luck. They just start from the right places. They know the tricks. Someday. Someday, I’ll get a lucky break too. I let him talk and talk. As I listened, he discovered most of the truths that I had hoped to teach him. And those truths will be his, forever. Smiling, he ran out to mow the lawn. Marie Arnold is an entrepreneur’s wife and a mother. She and her husband, Michael, homeschool their five curious, energetic, amazing children, ages 2 to 11. She calls herself, “An ordinary person, seeking for extraordinary truths to savor and share.” Her hobbies include reading, writing, reading, family history, reading, and leading a Den of Cub Scouts. On her blog she discusses books she’s been reading, explores ideas she’s been pondering, and shares her experiences homeschooling. You can connect with Marie on Facebook and by subscribing to her blog.